Consultation can deliver a real insight into a local area, create enduring beneficial relationships and of course provide the information necessary for a comprehensive Statement of Community Involvement (SCI) and ultimately achieve planning success. Yet frequently developers view consultation as a risk – more often than not because of concern that vocal locals may ambush events or insist on unviable changes. But there is good news for those who view consultation as acrimonious shouting matches in draughty village halls: public consultation has moved on. This article describes ten ways in which today’s consultations can engage effectively while minimising risk. The phrase ‘know thy enemy’ is inappropriate in the spirt of cooperative consultation but it certainly encapsulates the benefits of initial research. This includes understanding the number of residents to be targeted, the diversity within the community, its influencers, informal groups and patterns of interest, and opportunities to reach certain sections of the community – the ‘hard to reach’ but also importantly the ‘silent majority’. Information about stakeholders and their contact details, relevant influences and opinions can be collated in a simple database or on stakeholder engagement software. This enables individuals to be pin-pointed geographically, can reveal which sections of society are likely to respond to the planning application and how, and can enable excellent analysis. Databases should be continually maintained and expanded but used only for the purpose of the consultation and data protection rules must be adhered to – including GDPR legislation which takes effect in May 2018. The next stage is to consider the specific issues likely to influence the consultation. 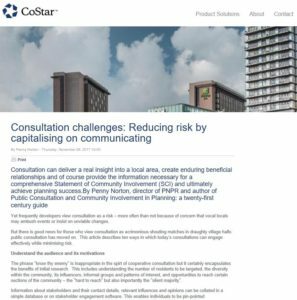 Knowledge of wider concerns (whether real and perceived), such as housing need and pressure on existing infrastructure, can provide a context for consultation responses and, importantly, enables the development team to address any misapprehensions. An issues database can set out the issues alongside an agreed response. As issues change during the course of a project and themes emerge or develop, the document should be updated. Usually such documents are not public but are shared within the development team to ensure that responses to difficult subjects are communicated with consistency. That said, an issues document (or elements of it) is frequently the basis for Frequently Asked Questions which may be displayed on the consultation website to show that the developer is aware of residents’ concerns. Many years of experience have taught me that the most effective way of keep a consultation on track and mitigating any criticism is to begin with a consultation mandate. Essentially this is promise to local residents which sets out the consultation purpose and objectives, the subject for discussion, the proposed programme and the application of the results. The consultation mandate is the best opportunity to put in place rules which then govern the consultation. For example, if it specifically disallows irrelevant comment or bad language from the consultation website discussion boards, the consultation mandate is justification for removing such comment. At the end of the process, the consultation mandate provides the ideal opportunity to evaluate the success of the consultation, demonstrating that it set out what it intended to do. Within reason, well-drafted questions have considerable potential to reduce negativity. In the case of an outline planning application, the consultation will focus on the content of the masterplan, rather than principle of development. The questions can then reiterate this – for example, ‘The Local Plan has identified a need for 30,000 new homes in the area to the period to 2035. This scheme provides for 4,000 homes. Given that a significant amount of new development is already agreed, are you in favour of our approach of providing family homes and apartments in five connected village settings?’. This approach avoids discussion on the housing figures within the Local Plan and concentrates the discussion on the features of the masterplan. Many developers are wary of consultation stirring up negative sentiment and providing an impetus for opposition groups. But a reluctant consultation is a risk in itself. This is particularly seen online, where failure to provide a means by which local residents can comment on a proposed development can result in those discussions taking place elsewhere online. In these situations, the developer may be unaware of escalating issues, which may only come to light when it is too late to address concerns or misapprehensions. Consequently, consultation websites are increasingly common but online consultation is relatively new and its take-up is often limited by a fear of the unknown. Common concerns are that a consultation will be hijacked by trolls, that a website will be open to corruption, and that registration will be off-putting. While each of these are genuine concerns, they need not stand in the way of a good online consultation, which can have numerous benefits – engaging tactics, increased accessibility and thorough reporting to name but a few. Online, a ‘troll’ is an entity which takes part in discussions purely to annoy and disturb other users. Anyone who has run a consultation will know that this behaviour can operate both on and offline. Online, there can be effective means of dealing with trolls. Disruptive behaviour can be stopped on the basis of the consultation mandate, as described earlier. Additionally, rules and regulations in relation to harassment, bullying and bad language can be contained within a website user guide. Software can be used to identify bad language and ‘spam’. Where necessary, posts can be removed with immediate effect, IP addresses banned and usernames invalidated. Consultation websites should be run with utmost security, not only to prevent hacking, phishing and spam but also because where user details are being collated, the legal and reputational impact of this falling into the wrong hands can be considerable. All websites can benefit from EV (Extended Validation) SSL (Secure Sockets Layer) certificates. Websites with this functionality display a padlock icon and https (Hyper Text Transfer Protocol Secure), rather than simply http (Hyper Text Transfer Protocol) in the URL. This means that all communications – including user names and passwords – between the browser and the website are encrypted and only accessible by the website owner. Registration can be extremely beneficial to a development team – for example, in restricting consultation responses to a specific locality and understanding more about those taking part. However, the need to register can be a deterrent. Potential users may be reluctant to pass on email addresses, passwords and other personal data, and may be put off by the amount of time (perceived or otherwise) that registration demands. Consultation websites should seek to make the process simple and reassuring, explaining the need for registration, referring to the security measures in place and making the process as smooth and simple as possible. There is an assumption that the media is naturally anti-development, that a local newspaper will always champion the voice of the resident over that of a corporate entity, and that bad news is more likely to make the headlines than good news. Admittedly this is sometimes true, but what better justification is needed for developers to engage with journalists? Few developers communicate with the local media in the early stages of consultation, entering into dialogue only (and often reluctantly) when a negative issue has been brought to the attention of the media. Frequently a negative, unbalanced and perhaps inaccurate story will have been published by this stage, causing substantial damage both to the consultation and the reputation of its partners. My recommended approach is to contact the local newspaper at the early stages of a consultation: use the consultation mandate to explain the process and remit of the consultation, ensure that the local media is fully furnished with facts and positive messages and has contact details in the case of future questions. The result is typically a positive story in the first instance, and a more balanced story should local residents approach the newspaper with concerns about the consultation or development proposals. Perhaps one of the greatest fears of those running a public consultation is negativity voiced by local interest groups, national activists and so-called NIMBYs. Earlier I mentioned the importance of researching issues at an early stage and creating an issues database. Technically there is little need to respond to points made until the end of the process; however, where contentious issues are raised and misapprehensions spread, it is often beneficial to respond to emerging issues in a public forum and at the very least will put misapprehensions into context for the purpose of the SCI. An issues database, whether publicly accessible or kept for reference purposes, can include figures relating to statistics (increased traffic figures in the case of a new road, housing allocations in the case of a detail development), and financial data (employment opportunities and the value of new scheme in monetary terms). It can be hard to change feelings with facts, but facts can certainly help. It is commonly known that those living closest to a development are most likely to object to it: perhaps because of the impact on their view, the pressure on local infrastructure, or merely the disruption of the construction process. Consequently there is considerable benefit in extending the geographical reach of a consultation in such a way that it includes those who will enjoy the benefits of the proposed scheme but aren’t swayed by these more subjective factors. Online consultation provides an ideal means for doing this: specific interest groups in the region might be contacted in relation to a new facility, and the users of large scale organisations targeted through social media. The promise of a substantial new amenity and a commitment by its developers to consult widely can raise expectations among local residents. But the higher the expectations, the greater the criticism – both of the proposals and of the process – if they are not met. Pre-consultation can enable a developer to discuss the remit and nature of the consultation with the local authority, special interest groups and in some cases, residents, at an early stage. Where a gulf exists between expectations and reality, this should become apparent and can be addressed. Often the solution need not be to offer more by way of consultation, but to consult in a way which is more suitable to the specific community. A consultation will disappoint if the consultation itself is at fault (it has failed to engage) or if its results are unwelcome (either failing to respect resident sentiment or perceived to be inaccurate). Either way, disappointment can fuel negativity – sometimes online, sometimes in the local media – and in the case of a developer’s planning application, may coincide with the point at which the planning application is being consulted upon by the local authority or considered at planning committee. At this stage it is generally too late for developers to change the consultation process or adapt proposals, and faced with possible criticism at a planning committee, the options are to withdraw and amend the application or risk it being refused. Evaluation is helpful in justifying the outcome: where a specific consultation framework has been put in place using pre-consultation dialogue and research, agreed with the local authority planning department and run accordingly, local authorities will understand that the consultation has met its objectives, despite opposing voices. Negative comment can be viewed in relation to the consultation remit, misapprehensions corrected and concerns addressed. Often overlooked on the basis that the consultation is complete, a diligent response as the final stage of the consultation process benefits both the SCI and ongoing communication with local residents during the construction phase. There is no prescription for a risk-free consultation, because no such thing exists. But a consultation which is open, transparent, accessible and engaging will encourage comment. In the eyes of the local planning authority, a good consultation is not one which is free of negative comment, but one which produces informed responses capable of shaping future plans and are accordingly. Invariably a strategic approach to a consultation, starting with a consultation mandate, is the best way to mitigate risk. And a consultation which uses this through approach avoids the risk of failing to produce an adequate SCI. First published in CoStar, October 2017. Penny Norton is the director of PNPR and runs ConsultOnline, on online consultation service. Her book Public Consultation and Community Involvement in Planning: a twenty-first century guide was published by Routledge in July 2017.